Unique. Indescribable. Extraordinary. Many could be the adjectives to describe the ENDURrun and all of them would fit perfectly to describe a race that was, by far, the one that gave the most pleasure to participate. Besides being a race that is in ways different from the typical “one day races”, many other aspects made it an exceptional race in every way. This final recap intends to express by words all this amazing adventure, that I would never imagined I would do, until the day I showed up on the starting line for the first stage. The premise is simple: 8 days, 7 stages, 160 km, 1 tough runner. In these 7 stages, many different types of courses (road, cross-country, trail, mountain and combinations of these) and with different lengths (ranging from 10 km to the marathon) expected the athletes. I started to think in participating in this race about 2 months before it began. I had raced the Waterloo 10 km Classic where I had the objective to beat my personal best at the distance, but in the last week of training muscular problems appeared and, although I've made a new personal best, I wasn't satisfied with it and I wanted to have a new challenge until the end of my running season. I must say that I've looked several times by ENDURrun since my arrival at Waterloo, but I always thought that it was very hard to do because of to the amount of races, their sequence and the existence of the marathon on the last day. Those who know me always heard me say that I would only try to do the marathon way after my 30’s, as it would take a lot of suffering to finish it and I could lose my pleasure on running. However, I chose to anticipate it and I’m very happy with the result. Now, that I’ve finished I can say, that despite my good time and without any specific preparation, I believe that I won’t be doing any other any time soon. But… “never say never”! 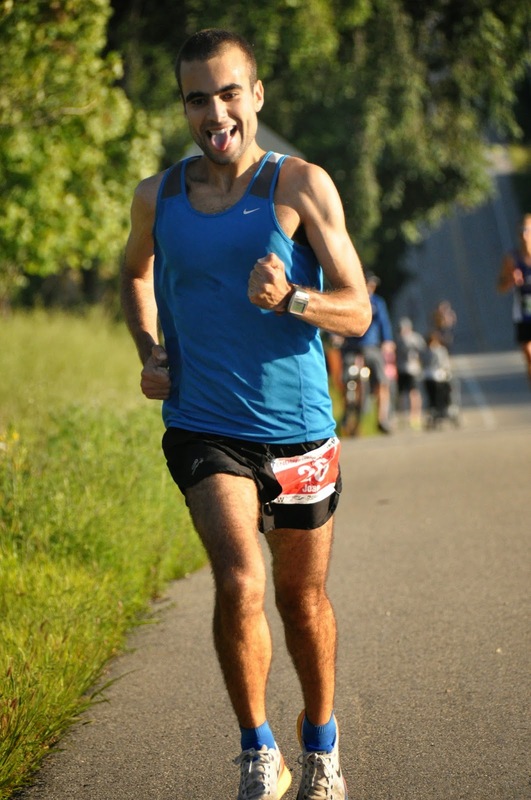 Initially my objective was to finish the ENDURrun without any muscular problems and with a total time below 12:50:00. I ended up blowing completely the finishing time with 11:32:24, meaning minus 1 hour and 17 minutes than I was expecting. Averaging, it was 160 km at a 4:20 / km pace. After the first 2 stages and seeing the level of my closest “opponents” I thought that I would have to settle for the 7th place in the overall. After all, on the places above mine I had “only” 3 former ENDURrun winners (Stefan, Rick and Mark), 1 former 2nd place in the ENDURrun (Pattrick), one participant in world stages of the IronMan (Christian) and one running machine disguised as a person (Matthew). As the ENDURrun went on, and especially after the 30 km cross-country at Bechtel, I started to believe that I could aim for a better position especially for top-5. On the marathon day I had a 11 minute advantage do manage in order to keep my 5th place in the overall classification. Although, I was only 4 to 5 minutes behind the 3rd and 4th places I knew that the experience and the high mileage of those athletes could make a difference in my first marathon. That experience ended up appearing, especially in the second half of the race, but I still managed to defend successfully my 5th place. As far as my and my coach expected results for finishing times in each stage before the beginning of the ENDURrun they can be seen in the table below. Both mine and my coach expectations were clearly to conservative looking at the way I presented myself in the race. Better this way than the other way around. So many! Without any question that winning stage 4 is the one that comes easily to my mind, especially for being a tough stage and by the other athletes never eased a little during the race. That was the day where I felt better and decided to attack far away from the finishing line and try my luck. The inherent difficulties of this hilly stage and the strong wind felted on the second half of the race only helped to put some more shining on this victory. The end of the marathon was also one of the best moments. Not only by the fact that I finished this amazing racing week but also for having Susana waiting for me in the finishing line. Never, before I began the ENDURrun, I dreamed in competing directly with the top athletes of the overall classification or win a stage, so I must say that in sporting terms all this experience exceed my best expectations. I reach the final stages with some realistic chances to battle for a place in the top-3, which was something out of my mind during my preparation for the ENDURrun. Without words to describe it. I’ll get back to Portugal so spoiled after all this. After each race we had a feast waiting for us. There was still the concern to adapt the food needs of every athlete. It was not only the usual water bottle at the end of the race or a fruit. We had a complete set of different option given by tireless volunteers always ready to help the athletes. The supplies given during all races were placed apart 2.5 or 3 km always with energy gels and always with water and with sports drinks. We had also several volunteers spread all around the courses ready to cheer for us when I passed by them. One last word to the photography team (also composed by volunteers) that each day took thousands of photos. Those photos were then treated and made available to the athletes, freely. Another good point for this race. And not we have the acknowledgements part. These are for those that one way of another helped me through this journey, either during its preparation or during the race. To Susana I have to thank for all the patience to endure my time schedule for training and understanding how I like to “suffer” (in her own words) and also for being waiting for me on the finishing line of the marathon. To my parents, that each day gave me support after the races over Skype (especially to my mother for saying everyday “do no push yourself too hard on the race”J). To my coach, Fábio Pinto, for putting me in the better physical shape of my “carreer” only with 6 weeks to prepare this adventure. The work that both of us developed this year ended up given very good results at the end of this season. To Bryan Sklar, from Relax and Restore Massage Services, who sponsored me by treating me during my preparation for the ENDURrun. 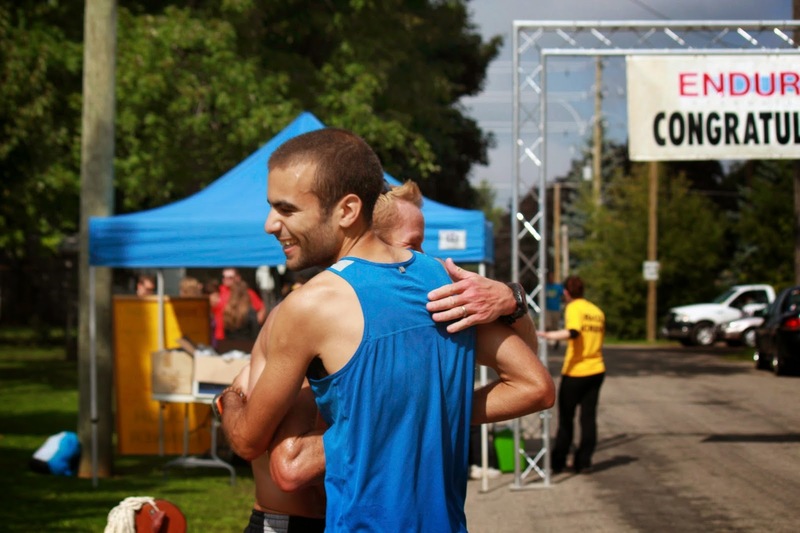 He was of great help especially in the hardest weeks of training and even during the week of the ENDURrun. To Jorge Branco, by his work on the divulgation of my blog during this week. The following acknowledgments are for the people relate with the ENDURrun. To all those, athletes or volunteers, whom I don’t mentioned my apologies, but, be aware that all of you were important so that I could overcome this challenge. To Schmidt’s family (Lloyd, Julie and Jordan) that during 1 week treated us like family and coordinated dozens of volunteers so that nothing we may lack nothing. To the amazing participants in the ENDURrun that even during the completion all support each other created excellent bonds and a great spirit of unity. I must thank to those who I spent more time competing: Stefan, Chris, Rick, Pattrick, Mark and Matthew. All of them, but especially the first 2 (as they were the ones with whom I spent more time running close), raised my competitive level to a point I’ve never reached before and made me a different athlete, for better. I will not forget the dozens of kms I’ve made with Stefan and Chris, especially in the cross-country stages, where even suffering we were able to laugh sometimes. I now refer only some athletes of the ENDURrun with whom I spend some more time. Even I don’t mentioned all of them beware I’ll never forget all of you. First of all I must thank to Michelle Lennox for during 8 days gave me a ride to the races and to the after-race “meetings”, also she is super nice and gave me a lot of encouragement before and after every stage. Then I thank Paul Mora for being such a nice athlete and person, always cheering for the other athletes. Also to Steve Mahood and Una Beaudry for being such a nice and thoughtful couple. To Andrew Moiser and its banjo, that always put a smile on my face when I was suffering in some stages. The only exception was the last lap at Chicopee, for obvious reasons. To Ben Hack, Chris Duke, Mark McDonald, Holger Kleinke, Jack Kilislian, Dusan Mataruga for being such a wonderful set of persons and atheltes. To Andrew and Heather Heij for having me in ther barbecue as a friend. To Kelly Thomas, Joanne Bink, Deirdre Large e Val Gudmundson by their support during the stages. These “thank you notes” are also extendible to all the female atheltes, and I must refer Mindy Fleming for being so nice and to for being able to stick up with the guys for so long. Finally I have to acknowledge everyone who gave me their support in this blog. I hope one day return and do this race again, knowing that it is not easy for logistical reasons, but who know. You did so great...beating all expectations. It was so nice to have the opportunity to meet you as well, though I was only in the last 3 stages. Great running Joao (can't do the accent). Thank you Robin, you too. Joao - It was a pleasure to meet you and try and chase you on the races (very far behind)! You inspired me each day and helped me get through the blisters, back ache and new shoes. I hope to run with you again soon - I may just sign up for the Harvest Half and would be so happy to be your "driver"! For sure we will seen each other again soon, as I'm planing on doing a soft run on the Harvest Half. But I'll tell you when I have 100% sure of that.